On Tuesday, January 22, the New York State Senate and the New York State Assembly are expected to commemorate the 46th anniversary of the disastrous Supreme Court decision in Roe v. Wade by passing a trifecta of anti-life bills. One of the three bills is the Boss Bill (S.660–Metzger/A.584–Jaffee), which would make it unlawful for employers—including faith-based charities—to adopt and enforce pro-life employee conduct policies. Click here to take action on the Boss Bill. Another of the three bills is the Comprehensive Contraception Coverage Act (CCCA) (S.659-A–Salazar/A.585-A–Cahill), which would require all group insurance policies issued or renewed after January 1, 2020 to cover abortion-causing drugs, voluntary sterilization procedures, and all other FDA-approved contraceptive devices without restrictions, copays, or cost sharing. Click here to take action on the Comprehensive Contraception Coverage Act. 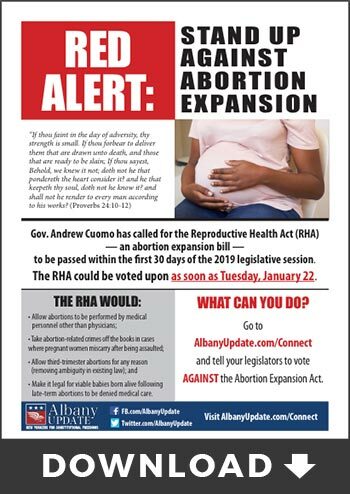 The third (and by far the worst) of the three bills is the notorious abortion expansion bill known as the Reproductive Health Act (RHA) (S.240-Krueger/A.21-Glick). 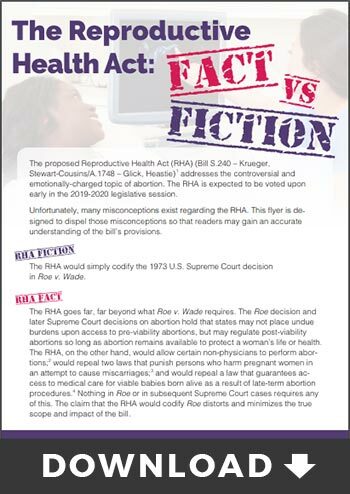 The RHA would allow non-physicians to perform abortions, would take abortion-related crimes off the books in cases where pregnant women miscarry after being assaulted, and would repeal existing protections for children born alive following attempted late-term abortions. If you have not yet contacted your elected officials regarding the RHA, click here. Despite our best efforts, we at New Yorkers for Constitutional Freedoms believe that each of these bills has sufficient votes to pass in the Assembly (which has passed them all in prior years) and in the Senate. However, Luke 18:27 reminds followers of Christ that “the things which are impossible with men are possible with God.” Proverbs 21:1 says, “The king’s heart is in the hand of the LORD, as the rivers of water: he turneth it whithersoever he will.” Please pray that the Lord will intervene on behalf of the unborn. Who knows what God may yet choose to do?